Krabi, with its picturesque beautiful coastline, karst formations and offshore islands is not an island in itself but a coastal province of Thailand with 154 islands in the Andaman Sea on the west coast of southern Thailand. 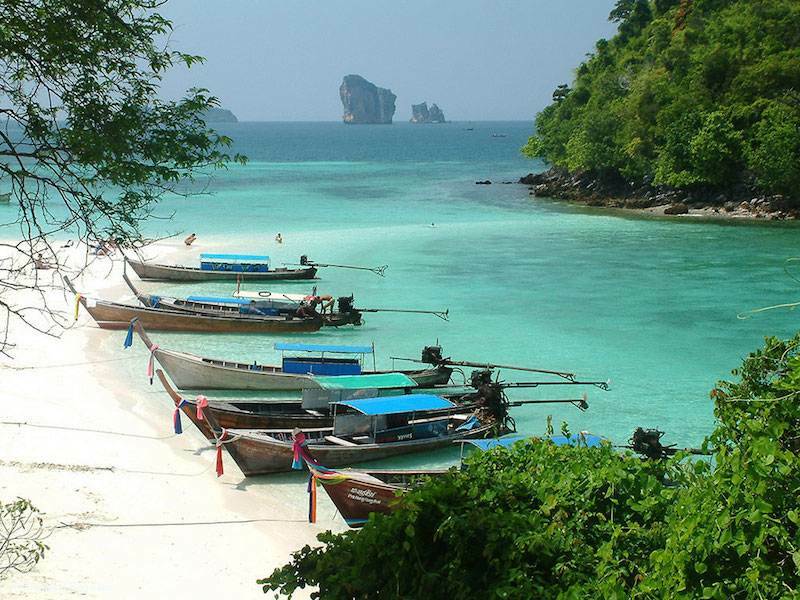 The capital of the region is the city of Krabi and is the perfect base camp to explore the islands of the province. The region is famous for its outstanding natural beauty, distinctive topography, limestone cliffs, rock karsts and pristine white sandy beaches. 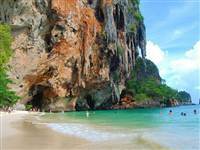 Krabi is truly a spectacular tropical paradise and one of the most attractive tourist destinations in southern Thailand. 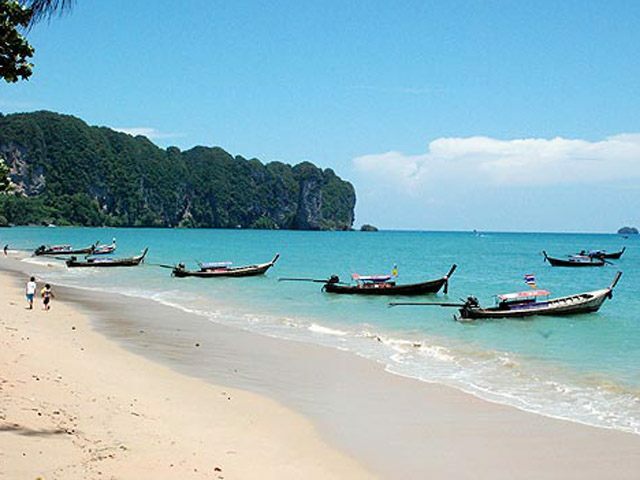 Krabi's amazing scenery makes it perfect a perfect location for outdoor activities throughout the year. You can either while away the hours basking in the glorious sunshine on a powder white sandy beach or there is adventure to be had with exploring caves and lagoons, snorkeling, diving or kayaking. If you have a head for heights, this is truly one of the best locations for rock climbing in Thailand. Our Krabi Villas all have private pools and are ideal family villas or for groups of friends who wish enjoy their own Thailand private villa with the services of a 4 or 5 star hotel. All the Krabi holiday villas have been hand picked by ourselves and have a guest relations manager to arrange transport requests, tour itineraries and in-villa requests such as a chef service, massage and beauty treatments. We also have a number of 4 and 5 bedroom Krabi beachfront villas proving very popular with our guests. 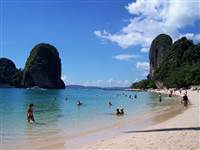 Krabi, with its picturesque beautiful coastline, karst formations and offshore islands is not an island in itself but a coastal province in Thailand of 154 islands in the Andaman Sea on the west coast of southern Thailand. Krabi has a number of watersport based and other activities to choose from as listed in the 'Activities' section however we have listed below a few of the many attractions that can be seen at a leisurely pace. 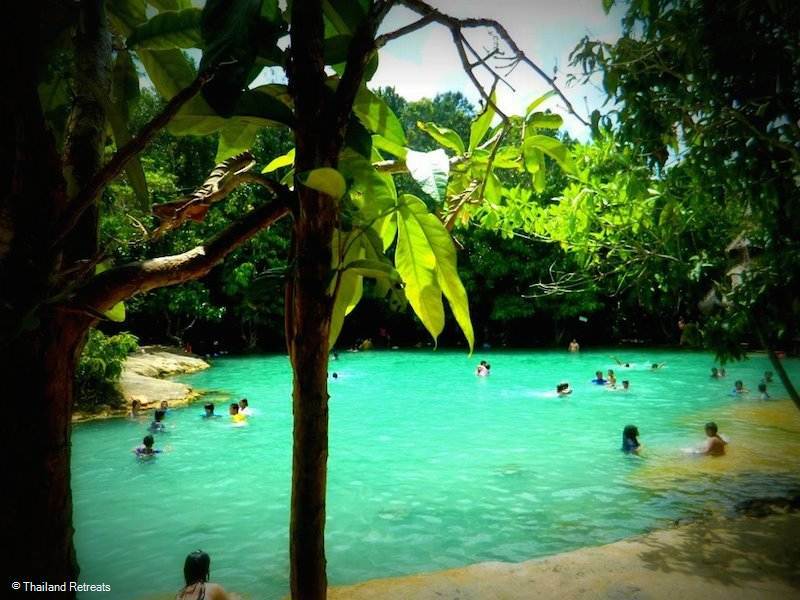 Located in a National Park follow a nature trail for up to 1200m through a forest exploring the different species of tropical plants before arriving at the very clear Emerald Pool which is fed by the areas abundant spring water and containing minerals. You can swim in this pool as the water comes up to chest level but will have to take care as the sides are slippery. Another 800m further up on a rugged pathway is the "blue" lake which is good to see but it is not possible to swim in this being very hot. Usually with a tour the Hot Springs are seen at the same time as the Emerald Pool as they are not too far apart. Located in the jungle they are nature's own hot-tub jacuzzis where the water here comes from thermal springs, originating deep underground in volcanic chambers. Natural hollowed out "bathtubs" are filled to the brim with fresh running spring water at a pleasant 35-42C. After a soak, take a refreshing dip in the cool river below. A hit for all the family with the children enjoying a change from bathing in the sea nad pool and others that wish to just soak away their aches and pains! 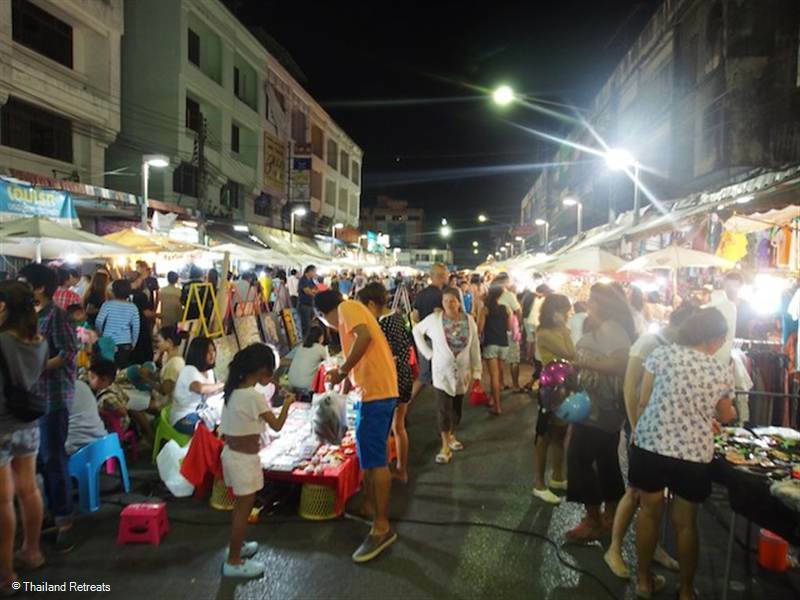 Although Ao Nang also has markets it is well worth a visit to the weekend "walking street" market in Krabi Town. It is only on Friday, Saturday ad Sunday nights and for fun and varietywith a stage show of local talent provided. 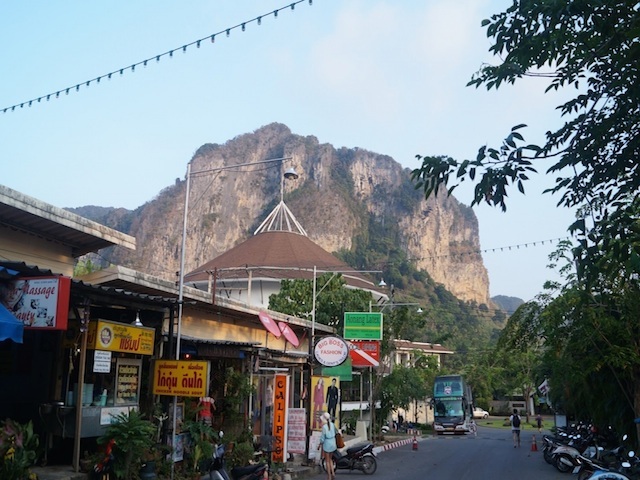 Aptly named because of the rock outgrowth nearby resembles a tiger's claw, is considered by the Krabi Buddhists to be one of the most sacred sites in the province and well worth a visit. Some 250 monks and nuns live in the temple compounds at the moment. The staircases up to the temple are rather challenging however the view from the top, combined with the lovely Buddha statuary, makes the summit of the hill an unforgettably beautiful place. Many like to unwind on holiday by experiencing blissful treatments and Krabi offers some of the best spas in Thailand whether it be under a canopy on the beach or in a 5-star luxury resort you will certainly find something to suit your need. 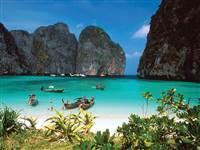 Krabi is located just over 800 kilometers south of Bangkok and is part of the Andaman Sea coastline on the southern west coast of Thailand. 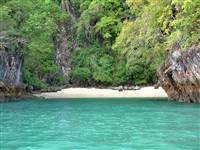 It is 170km from Phuket and is easily accessible by road, air and sea. The simplest way to arrive is via Krabi International Airport and currently you can fly direct to Krabi from Bangkok, Chiang Mai, Koh Samui, Singapore and Kuala Lumpur. Thai Airways are the main operators from Bangkok to Krabi with 4 – 5 flights daily and are the best choice if you have a connecting international flight through this city. The budget airline Tiger Airways has daily flights from Singapore for those using that city as a hub if travelling from Australia and New Zealand. Air Asia also has a daily flight from Singapore to Krabi. Other international hubs for connecting flights include Kuala Lumpur with twice daily flights to Krabi by Malaysian Airlines and Penang with daily flights ti Krabi by Firefly Airlines. Air Asia and Nok Air – both budget airlines operates 8 flights and 2 flights daily respectively from Bangkok to Krabi. Bangkok Airways operates direct flights from Bangkok and Koh Samui twice daily. Note: During the high season months off November – April charter flights operate from Scandinavia, China, Germany and Russia. Many of the private villas offer a transfer service as with the hotels from the airport in the main tourist areas otherwise there are efficient regulated taxis available. Here is also a bus service to Ao Nang and Krabi town whoever you may have to sit and wait until there is enough passengers fro each journey. Should you wish a to travel through Thailand’s mainland there are ample public and private buses operating to Krabi from Bangkok ( about 10 hours), Koh Samui (via Surathani), Phuket, Trang and many other destinations including Malaysia. Trains are available to get you as far as Phuket, then simply hop on a bus or one of the many passenger ferries or private boats to get to these idyllic islands. 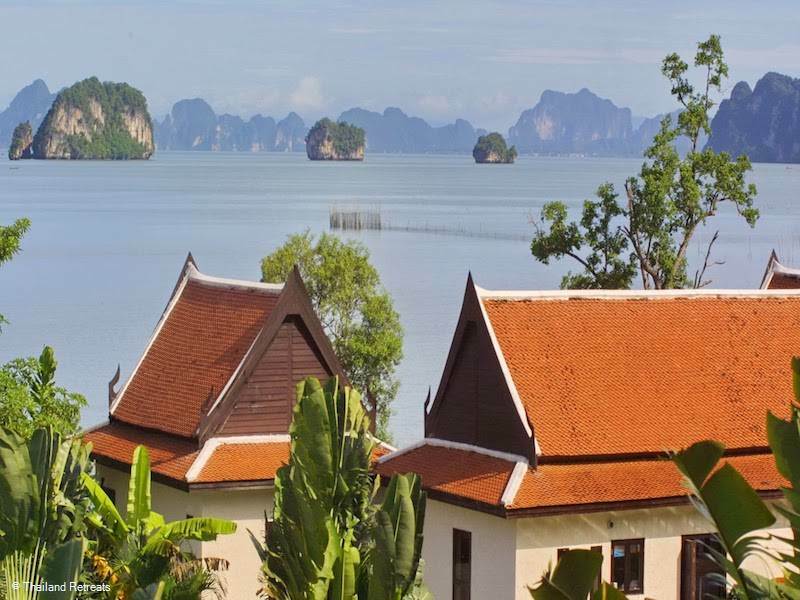 Not sure where to stay in Krabi Thailand? Thailand Retreats has a wide range of villas to rent in Krabi. Here's our insider knowledge of each area. The perfect retreat of a private luxury oceanside villa with amazing views of Phang Nga Bay at Thalane Bay, a villas close to the popular restaurants and shops of Ao Nang beach or our spacious 2/3 storey beachside villas to close to Ao Nam Mao. Choose what's best for you. Ao Thalane (Thalane Bay) is a small fishing village located in the heart of a natural network of intricate mangrove channels surrounded by towering limestone formations. 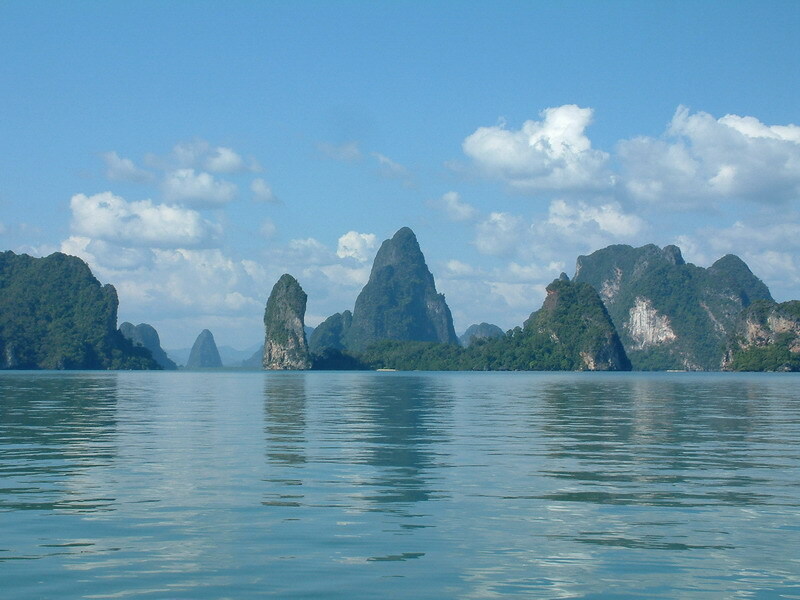 Although a tranquil and beautiful area it is only 25 minutes drive to Ao Nang town with a choice of restaurants and various sight seeing trips on offer. A little island with a secluded beach in Phang Nga Bay located opposite our villas in Ao Thalane and can be reached 10 minuted by long tail boat. Located right in front of one of our private Krabi Villas at Thalane Bay is the island of Koh Ten which has a white sandy beach area set in a secluded small bay where you can swim to your hearts content and relax amongst nature. .
Krabi has been chosen as one of the premier tourist destinations in Thailand being more family-friendly and far less developed than most other famous Thailand beach resorts. 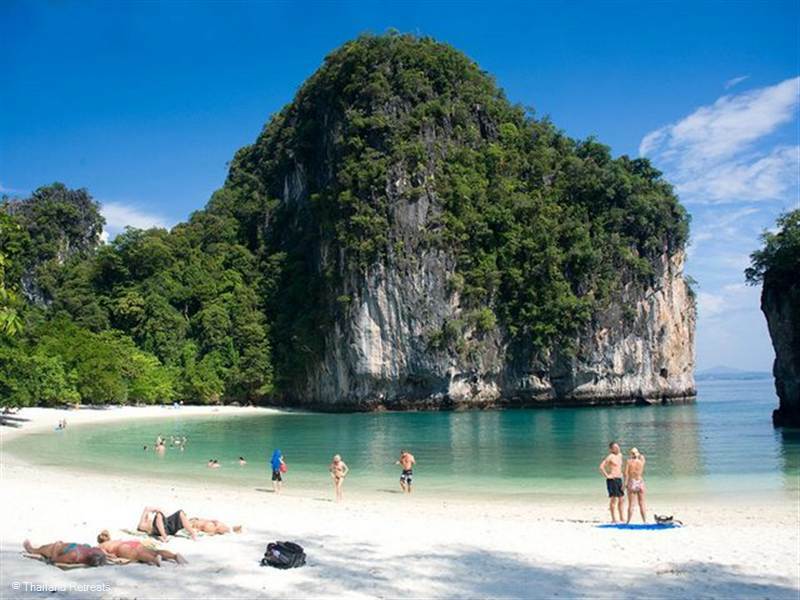 With this in mind a Krabi holiday in Thailand has something of interest for everyone whether you wan to be active, to just sight see or just laze on the many beautiful beaches that make up this scenic area. The villa manager at our Krabi Villas will advise the most reputable companies to book the tours of your choice. 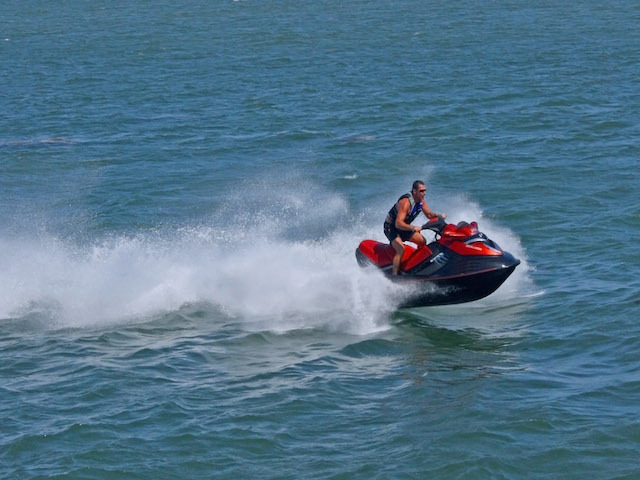 Most of the popular beaches have jet-ski concessions to explore the local bay on your own and discover small coves or join an organised tour with one of the many boat charter companies. The waters surrounding Krabi are teaming with fish and there are half day and full day fishing trips available by big boat or long tail boat with all equipment provided - some combined with snorkeling. Special program of night fishing also available. 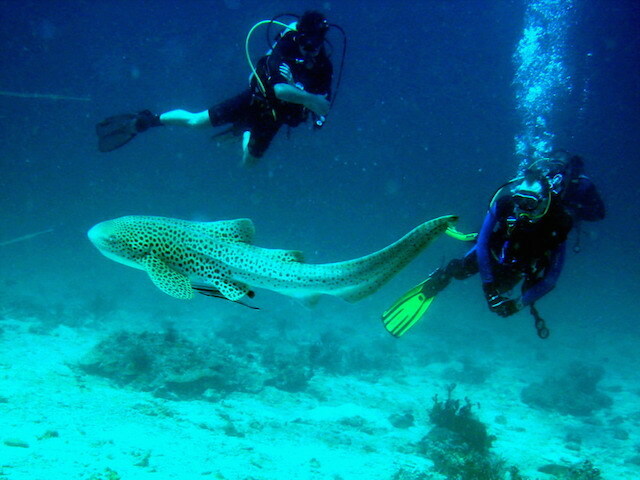 Krabi is a wonderful location to enjoy snorkeling and diving, in part thanks to the likes of friendly whale sharks, dolphins and turtles that grace the azure crystal clear waters. 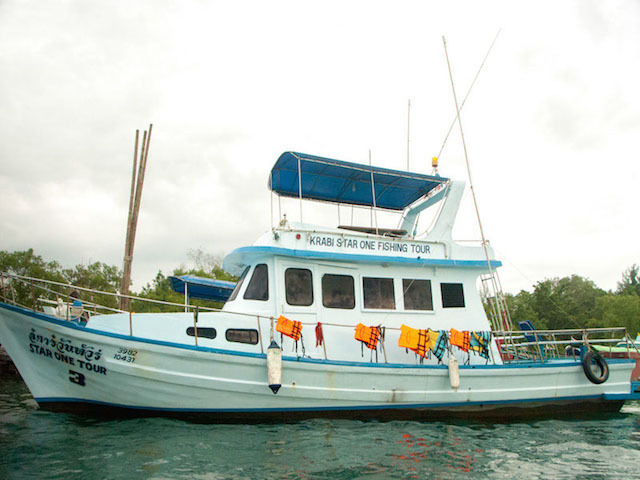 There are many reputable dive schools to choose from. 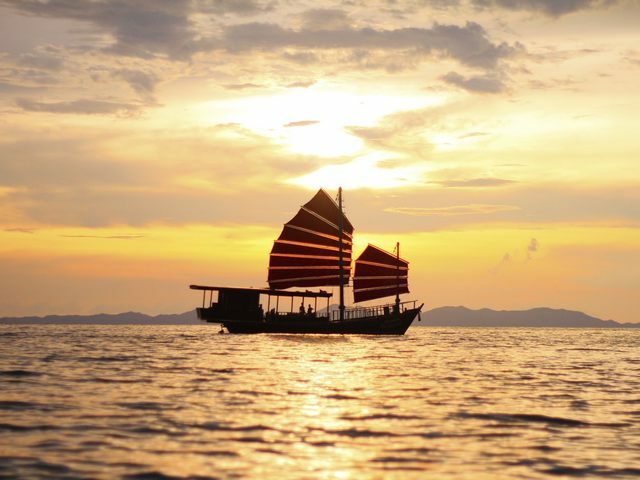 Have the ultimate experience in Srisupai - a Thai style junk boat and take a private sailing tour aound the south Andaman Sea islands of Chicken Island, Koh Poda and Tub Islan via Railey Bay. Sunset trips also available. A great way to explore Krabi's amazing scenery and spotting several speacies of birds and animals on the way. 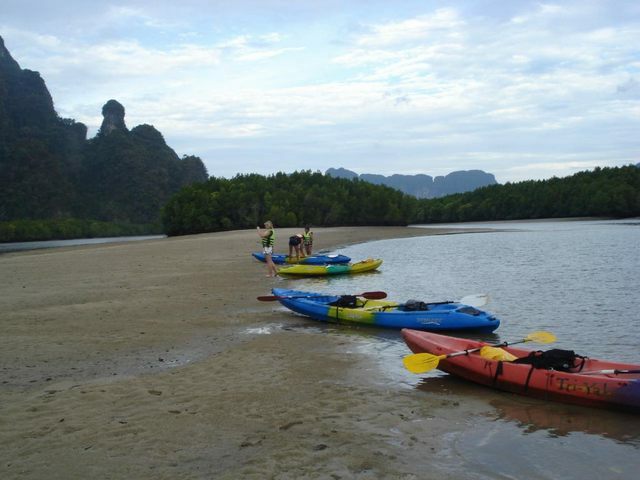 There are 3 main areas that the tours take in for kayaking - Ao Luk in the north of Krabi, Ao Thalane on the tip pg Phang Nga Bay and the island of Koh Hong where there is plenty to explore beyond the main popular beach. Usually at the top of everyones "to do" list on Koh Samui. 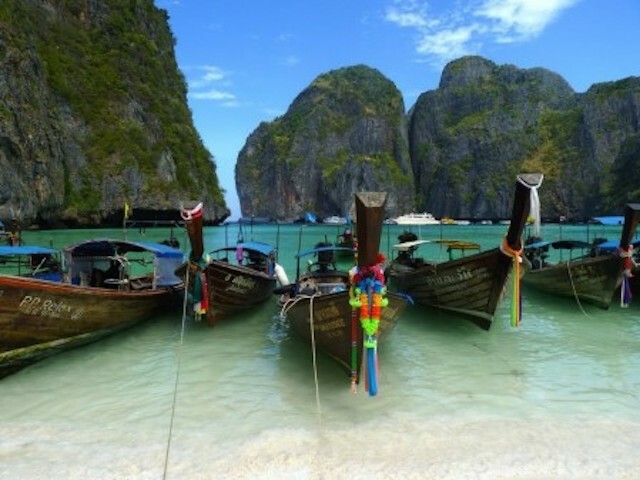 There are 4 groups of islands to visit and can be done in a day trip with the Phi Phi Islands and James Island being the furthest away ( and the busiest) and the 4 islands (including Koh Poda and the Hong Islands the closest. 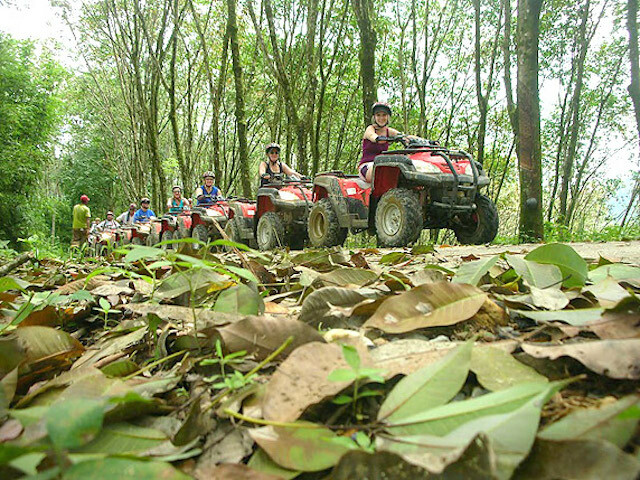 Often combined with elephant trekking and a dip in a waterfall there are many programs available for all the family from 30mins fun to 2 hours. There are no shopping malls or supermarkets here but there are plenty of convenience stores and souvenir shops as well as clothes shops selling anything and everything. These are lined together along the main beachfront road and some smaller roads off the main road. The towering rock formations here draw climbers from around the globe. There are a number of climbing schools that offer training to suit allabilities. 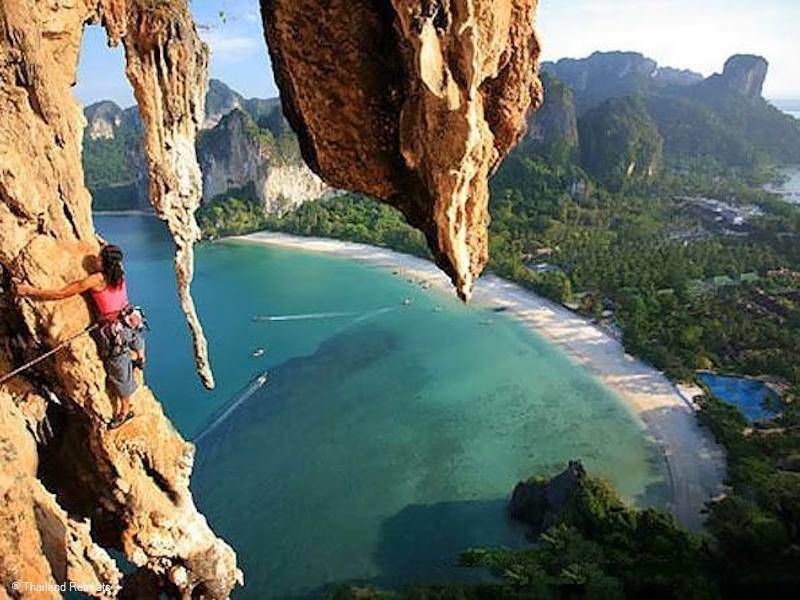 The stunning limestone cliffs of Railey have over 600 bolted roots and is one of the most popular climbing areas of Krabi. 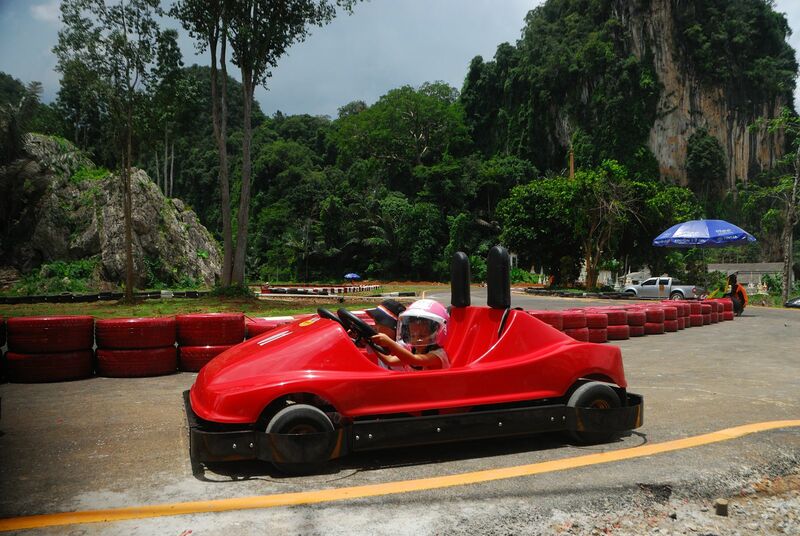 Take a break from relaxing by the beach and visit Krabi's new go kart track. The track is one km long, high quality tarmac and weaves literally around one of krabi's mountains. There are three types of karts available including 2 seaters with dual controls for younger children and 200cc single seaters for adults. A cycle tour will take you to some of the finest and most spectacular un-spoilt places you can imagine. 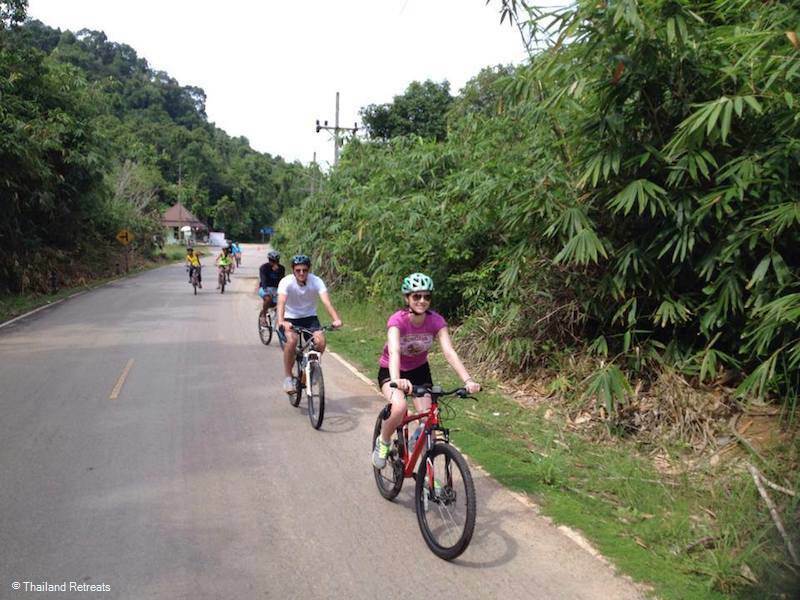 Tracks, fire trails, back country single tracks as well as covering large distances in beautiful Thailand. At the same time, traveling by bicycle gives you a great sense of independence. 2 or 3 hour tours along the beach and enjoy stunning views. 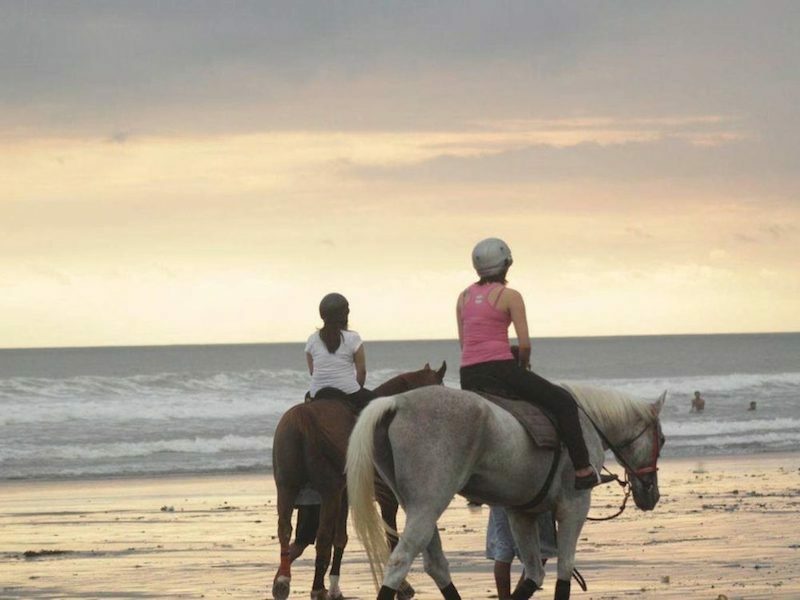 Sunset treks also available and the horses can go into the water. 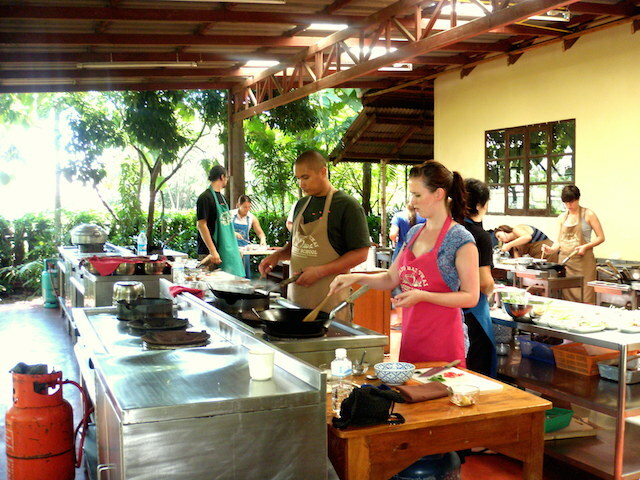 Krabi caters for all palates with an extensive choice of places to eat. There are numerous restaurants and beach bars concentrated in the tourist areas serving everything from a simple bowl of noodles, classic Thai, Italian, Swiss and everything in between. Being a seaside resort, Krabi is also a great place to enjoy fantastic fresh seafood. Some of the larger hotels offer excellent world class cuisine. As far as nightlife is concerned this is limited with popular Phi Phi having The Reggae Bar which quite a noisy entertainment complex with spirited dancing and partying carrying on throughout the night.